It’s free, fast, and simple. Our Partner Program is the first and largest affiliate program of its kind in the cosmetic surgery and non-surgical beauty enhancement industry created specifically for cosmetic surgery/beauty companies and industry professionals. As a Partner, you will earn 20% of all net profit resulting from site visitors who are referred from your website and who purchase any of the 100,000 products that we offer. Our product line includes the leading brands of plastic surgery recovery and preparation products, top science-based skin care, anti-aging, and make up brands, and doctor-recommended products that are only available through physicians. Without any upfront or monthly fees, and no time investment or risk, you can tap into a strong and continuous stream of passive revenues from products that your patients and/or customers need for their cosmetic procedures and for their daily beauty maintenance and antiaging program. Once you are a Partner, you will have nothing to do because Make Me Heal will take care of all aspects of the order process, credit card validation, payment, billing, shipping, returns/exchanges, and any customer service needs. At the end of each month, you will be sent a check with your 20% share of the net sales. The Partner Program is straightforward and works as follows: Whenever a visitor goes on your website and clicks on products displayed on the 1-page mini store that we create for you, the visitor will be re-routed to the Makemeheal.com website. If a referred visitor purchases any of the 100,000 products on our website, our state-of-the-art technological system will automatically credit you for 20% of the net profit from every order by a referred visitor. Becoming a Partner takes only a few minutes to be set up and requires no installation of any web software. Within minutes, you will be able to start benefiting from sales generated by patients and visitors referred from your website. It's that easy. Among the 100,000 products that are included in the Partner Program are over 1000 plastic surgery/cosmetic procedures products for a wide range of surgical and non-surgical procedures that can help patients prepare better, heal faster, recover safely, and obtain better cosmetic outcomes from their procedures. Our product line includes the top brands of post-op support and compression garments, scar healing/reduction products, warm/cold therapy compress solutions for swelling and bruising, specialized recovery pillows to reduce swelling and enhance comfort during post-op (wedge/elevation pillows, comfort pillows for different body parts), remedies for bruising, swelling, erythema, hyperpigmentation, and other post-surgery symptoms/complications, eye drops, skin care solutions for pre & post-op, corrective/camouflage makeup (for hiding bruising, swelling, scars, redness, and other procedure-related symptoms), bed comfort and bath safety accessories, and various other types of products. To address the needs of consumers who are seeking products that can help them in their daily beauty maintenance and anti-aging program, the Make Me Heal Partner Program will enable you to offer to customers over 3000 science-based skin care, antiaging, and corrective make up products from the leading brands and doctor-recommended products that are only available through physicians. Among the brands include Afirm, Cellex-C, DDF, Dermablend, Exuviance, Gly Derm, Gly Tone, Jane Iredale, Kinerase, Klein-Becker/StriVectin SD, MD Forte, Murad, Neostrata, Neova, Obagi, Person & Covey, Procyte, Peter Thomas Roth, ROC, SkinMedica/TNS Recovery Complex, and many other leading brands). 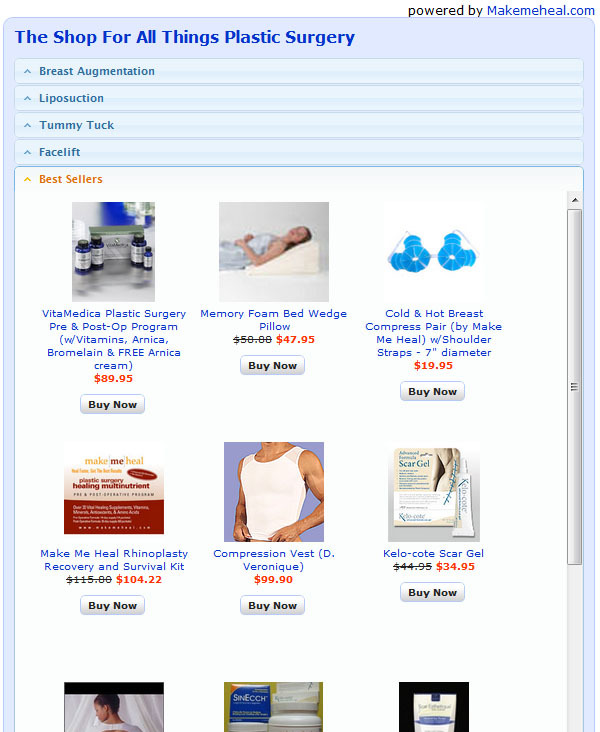 With only a few minutes of work, you will be able to have a 1-page mini E-Store on your website featuring some of our products in the same aesthetically pleasing format of the Makemeheal.com E-Stores. The implementation is simple and requires no financial investment or time, and there is no need to build, install, or upgrade any type of web software or technology on your site. The implementation involves copying 1 line of code that will be pasted in any page you desire to have as the entrance to the store. Once this line of code is pasted, the entire E-Store will load dynamically on your website and will feature a wide array of products. It’s that easy. If you need help, please contact us through our Online Message Center. Even if you don’t have your own website, we can create a mini E-Store for you for free within a setup time of 1-day. The free site will be hosted on our systems and you can refer anyone to it. 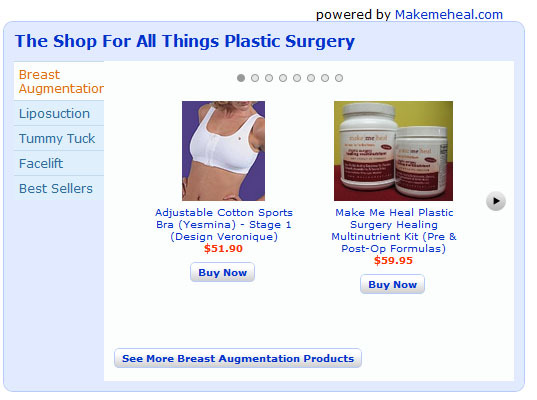 When a visitor clicks on products displayed on your website’s E-Store, the visitor will be re-routed to the Makemeheal.com website. If a referred visitor purchases any of the 4000 products on our website, our state-of-the-art technological system will automatically credit you for 20% of the net sales from every order by a referred visitor. You will be able to view your net sales in a personal account that is created for you. Make Me Heal will take care of all aspects of the order process, credit card validation, billing, payment, shipping, and any customer service needs associated with the order (i.e. returns, exchanges, etc.). You have nothing to do and you have no legal responsibility with respect to the customer or the order fulfillment. All orders with consumers referred from your website with respect to any transaction are the responsibility of Make Me Heal. No Inventory: As a Partner, you will never have to carry any inventory, order or pre-pay for any products. Even though the mini E-Store that we create on your website will feature only a portion of our full line of products, you will receive your 20% net sales participation on any product that is purchased by a visitor referred from your website. Essentially, when a visitor is re-routed to our website from your site, you will earn money on any product that such a visitor purchases even if such a product does not appear on your website’s mini E-Store that we create for you. As a Partner, you will have real-time access to a private account where you can view daily reports of your sale referrals, including an itemization of every sale you generated by referral and the amount due to you for each such referred sale. At the end of each month, you will be sent a check with your 20% share of the net profit from customers referred by you.